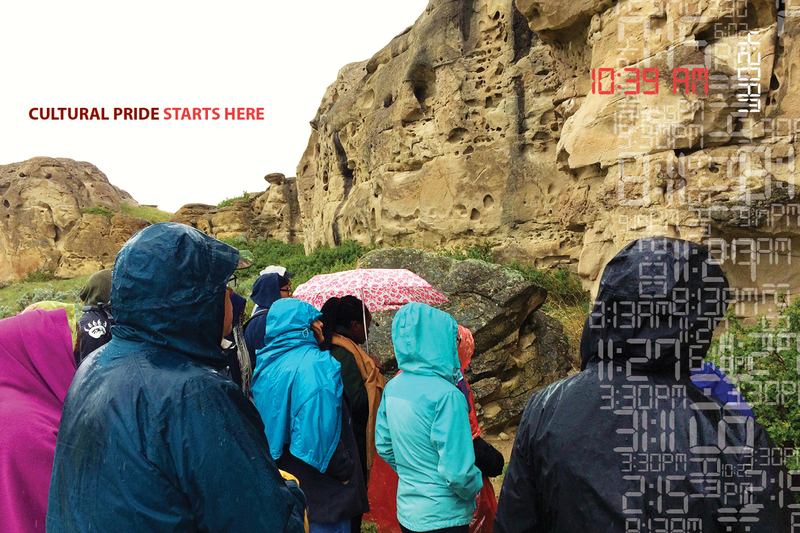 10:39 am: Indigenous youth board the bus headed to Writing On Stone Provincial Park to participate in a vibrant cultural experience that they will never forget. Every hour of every day, YMCA Calgary is making a difference in someone’s life. A short bus ride, a lifelong impact. In May 2016, indigenous youth in YMCA Calgary’s Y7G program visited the sacred Writing on Stone Provincial Park, in southern Alberta, to learn more about their heritage. Y7G is a program that connects indigenous young people to their traditional culture and fosters a sense of pride in their heritage. On this trip, two groups left their usual urban environments and headed to sacred land. “It feels like it’s home. Your spirit feels at ease. You feel a calmness within yourself,” said Indigenous Manager Sarena Provost. The tour guide began by taking the group to a path that wound alongside the rock faces that hold the famous ancestral art of the Blackfoot people. The kids found it incredible to behold an ancient form of communication withstanding the test of time. Over a thousand years later, it was as if their ancestors were sharing their stories with them right before their very eyes. Each picture told a different story and could be interpreted in many different ways. These pictures all told a story of perseverance. The leaders of the group saw this as a beautiful metaphor – the rock faces showed the same resilience as every one of the youth standing there as they connected with their culture and learned to keep it alive in themselves. After walking the length of just some of the rock art that was present on this land, the group gathered indoors and sat in a circle around a Blackfoot Elder, Randy Bottle, to hear the teachings that he wanted to offer the youth. In turn, each student spoke of their experience that day and how they had instantly connected with the land and their heritage through this unique moment.